From the World Series 12′6 SUP class for both Long Distance and Sprint Racing (and overall result), to the 14′ and Open SUP Classes for the Long Distance, to the Prone paddle division for both races and the overall result, the Stand Up World Series Finals has something for everyone this weekend, so is an event not to be missed. 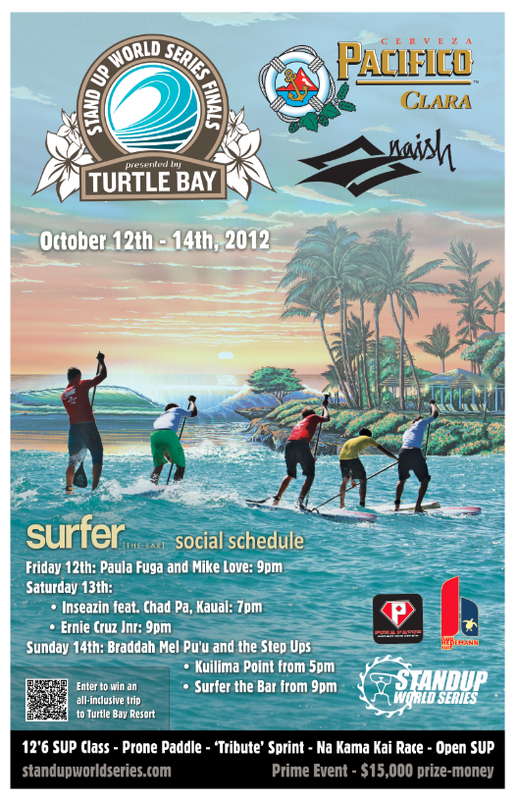 You can register online still at register.standupworldseries.com, or directly on site at Turtle Bay between 10am and 12pm tomorrow (Saturday morning). As Hawaii comes into its legendary winter season here on the North Shore, everything is set for one of the most spectacular races of the year, with ideal conditions in store consisting of 3 – 4ft surf and steady trades. Don’t miss out. 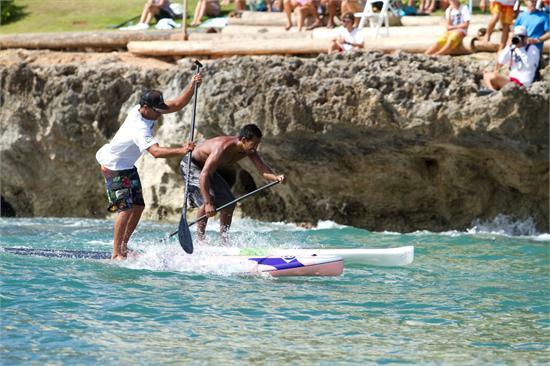 In honor and with the vision of our long term partner Na Kama Kai and its founder Duane DeSoto at heart, we are proud to announce that the Na Kama Kai Race Challenge will take place tomorrow (Saturday) between 9am and 11am in front of Ola’s Restaurant on the east side of the Turtle Bay property. Kids that are U15 and of any level (beginner and up) are all welcome for a free morning of action at Turtle Bay, as they will be given an introduction to the sport and pointers from the World’s best all culminating in a fun figure of 8 racing course. 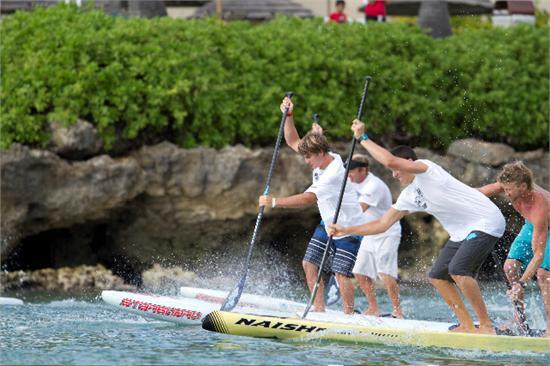 Naish ‘One’ boards will be provided for kids to use in the race, together with t-shirts, hats and an unforgettable morning for the Keiki of Hawaii. Check in for all youth will take place from 8am on the beach in front of Ola’s. It has been an exciting week in the Hawaiian Islands this week, as the first big swell of the season hit providing epic conditions across the island chain as Big Wave Surfing was once again stepped up a level. As we look to our Champions, and perhaps more specifically the exciting rivalry that has developed between Maui’s Kai Lenny (Naish) and Connor Baxter (Starboard), it is interesting to see that both chose a similar preparation technique this week, tackling the giant surf at Peahi (Jaws) laying down. As a testament to their ‘Waterman Skills’, both athletes scored some great waves at this iconic wave on North Shore of Maui as they etch their names in the global surfing arena, but not switch their focus back to the World Title Race as it all comes down to the wire here at Turtle Bay Resort. 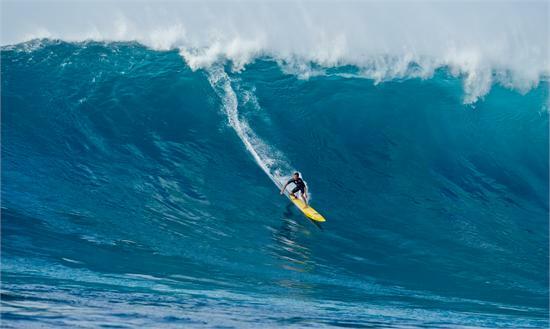 Here we see Kai, one of the standouts of the second day of action at Jaws, dropping into a gem…. 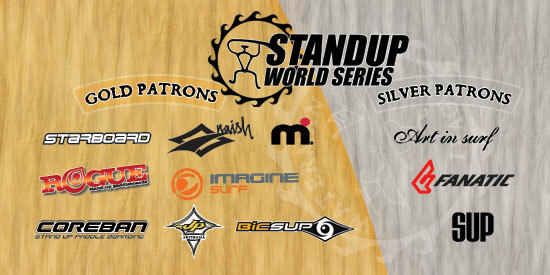 From the more anticipated Hawaii, US, Australia and France, to the emerging powerhouses such as Mexico and New Zealand, to the more unexpected countries represented such as Denmark and Israel, the international field congregating at Turtle Bay this weekend will provide a fitting representation of the global nature of the Stand Up World Series. This is the Top 12 coming into the Finals, but a force to watch out for that is just on the cusp of the Top 12 currently is 15 year old Mo Freitas, who is coming off a phenomenal run this past few months inclusive of an impressive performance at the last World Series in Florida, but also the Battle of the Paddle. What’s more, this is his home, so he will be one to watch out for this weekend. Other dark horses will without doubt be the Napoleon family, as Aaron (Rogue) will put his years of experience to play out here in Hawaii, as will his son, Riggs (Rogue), both looking to stamp their names on this prestigious race on the North Shore of Oahu. If there is one athlete that has quite simply not faltered this year, it is New Zealander Annabel Anderson. With an unblemished record of straight wins at everything she has entered this year, notching up several victories over even the men’s fleet, Annabel Anderson has also dominated the women’s division of the Stand Up World Series. Annabel will be looking to secure her first Stand Up World Series Title this year at Turtle Bay, but will not be without competition: from Morgan Hoesterrey, Mariko Strickland and Talia Gangini, to underground athletes such as Rachel Bruntsch and Halie Harrison, Annabel will have her work cut out this weekend for what will be one of the most exciting showdowns of the year. Stay tuned to finals.standupworldseries.com and watch it go down live on the Final day, Sunday 14th October as we broadcast from Stand Up Paddling’s ultimate arena here at Turtle Bay. One thing is for sure, while the Kai / Connor rivalry has proved a center piece leading into this event and promises to continue that way, the wealth of internation talent rising up behind will without doubt cause some upsets and could prove to be defining here at the World Series Finals. Experienced competitive powerhouses such as Slater Trout, Eric Terrien (Bic SUP), Fernando Stalla (Rogue), Ryan Helm will be looking to take down the leading two, as will the exciting emergence of youth talent such as Kody Kerbox (Naish), Casper Steinfath (Naish), Noa Ginella (Naish), Matt Becker, Jake Jensen (Naish) and of course the above mentioned Mo Freitas. Also never to be counted out and a dominant force in the sprint racing format, especially when there is surf, is the wildman Zane Schweitzer: winner of the 2011 Sprints here at Turtle Bay and finalist in the Summer Paddle Challenge, Zane knows how to claim victory and will be gunning for a spectacular end to his year now that he is back to full fitness. This is also the case for long distance expert, Andrew Logreco, who stole victory on this course in 2011. With ideal conditions forecast for the weekend for both the long distance from Turtle Bay to Haleiwa and the World Series Sprint Racing in front of Hang Ten Bar at Turtle Bay, the racing promises to be intense, and the action, spectacular, as the world’s best put it all on the line one last time for 2012 in the quest for the inaugural World Series Title. 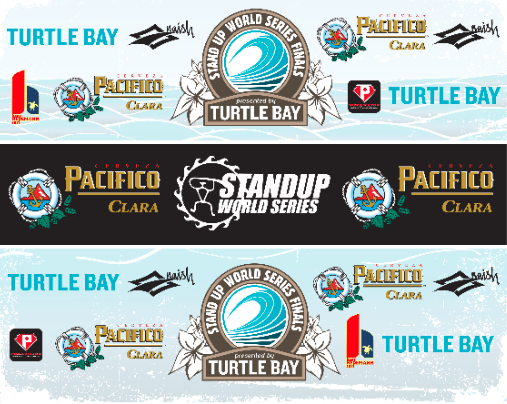 Stay tuned to finals.standupworldseries.com for lead up, news, highlights and the live broadcast on Sunday from Pacifico’s Stand Up World Series Finals at Turtle Bay Resort in association with Naish.